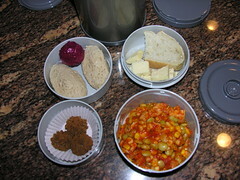 Here is the second Mr. Bento photo I posted on flickr.com. 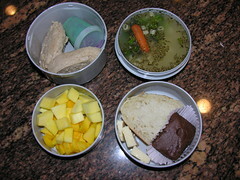 Gefilte fish + horseradish, diced mangoes, chicken broth with vegetables + pasta, sourdough bread + cheddar cheese, plus a chocolate-iced brownie. What a feast! I had a nice simple lunch today. My wife's cousin sent us a 5-pound bag of genmai, Japanese short-grain brown rice. I put a cup in my rice cooker this morning, set it for noon, and at 12 o'clock spooned it out into two bowls. My wife added a little milk to hers to loosen it up. I just diced up some smoked Nova Scotia style salmon and mixed it in. Nice, simple lunch. Only 51 more servings left in the bag of genmai. Any suggestions?